This Tuesday, February 28th, is National Pancake Day! You could go and celebrate with all you can eat pancakes at sub-par diner A, B, or C… or you can make your own pancakes and celebrate in a healthy and delicious way! These Almond Oatmeal Pancakes start with making homemade almond oat flour, which gives a great nutty taste to the batter. The almonds also add protein, so you can serve them by themselves and still have a balanced meal. 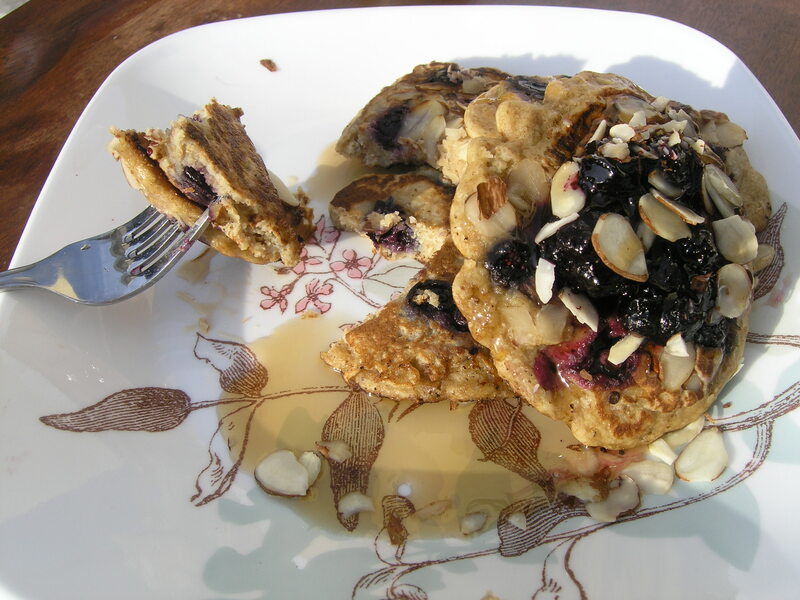 Fresh blueberries give the pancakes a healthy dose of antioxidants, but you can substitute them for any seasonal fruit. Combine 1 cup of the oats with the whole almonds in a food processor. Pulse and eventually blend the two together until it all becomes a course flour consistency. Don’t over process or the heat from the processor will cause the flour to clump. Mix almond flour, whole wheat flour, baking powder, and salt in a large bowl with a whisk. Set aside. Cook the remaining 3/4 cup oats in 1 1/4 cup water in the microwave for two minutes. Set aside until cool. In a separate bowl, whisk together the brown sugar and eggs until well combined. Add the milk, syrup, nutmeg, and vanilla extract, making sure everything is incorporated. Make a well in the dry ingredients and pour the liquid into the dry. Use a rubber spatula to fold together, being careful not to over mix. You’ll get some pretty tough pancakes if you do! Fold the cooked oats into the batter the same way. Heat a large skillet over medium heat. Spray cooking spray onto the pan between each round of pancakes. Use a 1/4 cup measuring cup to pour the batter into the pan. I could fit about three in a large skillet at once. 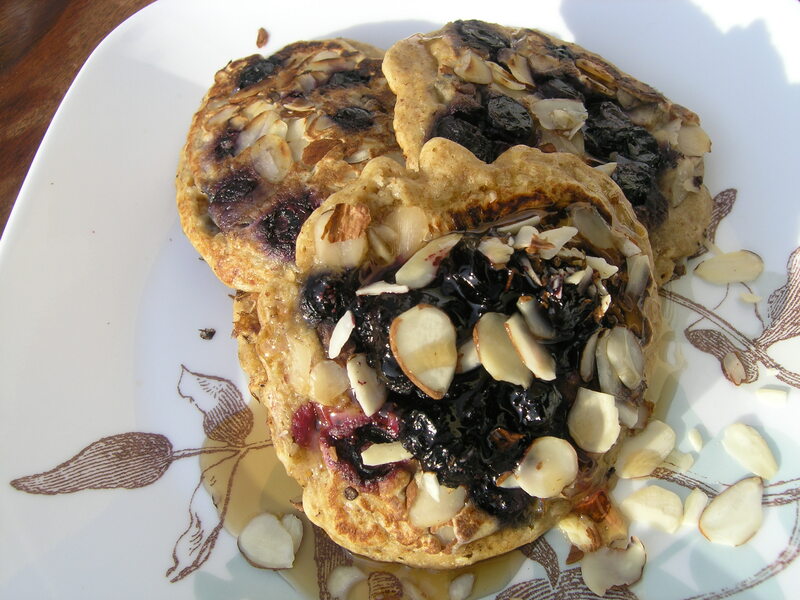 Add a few blueberries (4-5) and some sliced almonds into the pancakes. Cook the pancakes for 2-3 minutes per side, or until the batter begins to bubble. Flip the pancakes and cook for another 2 minutes or so. Remove from the pan and keep warm under foil. Repeat for the remaining dough. Serve the pancakes with hot maple syrup. Top with more fresh blueberries and sliced almonds for garnish. I’m normally not a pancake person, but these look delicious and I can’t wait to try them!